Lighted by LED, the visualized color current charging is achieved, which also ensures 10 times than LE. In addition, the light source of the flash charging line is ultra-low power LED that goes directly to fiber. Thus, there is the effect of lasting blue light. 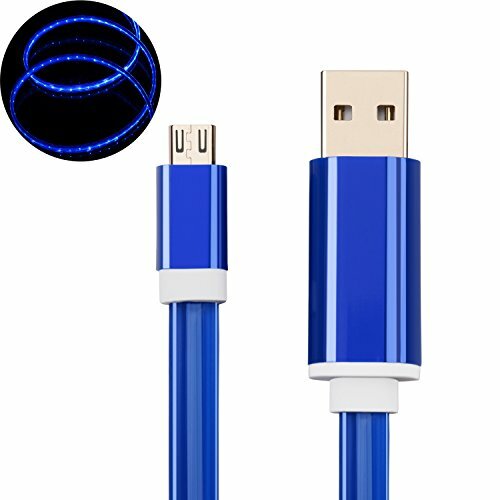 he cable is made from blue soft and transparent material, and can be bent, knotted, which will not influence the current size and light effect.Easy to use in office and travel, you can charge your micro Phone through Car USB. It is not only a charge cable but also night light when you charge your phone at night. It can also use as atmosphere lights on holiday parties. It can also use as colorful wall light and decoration when put it lawn. It will add delights when you work at night. While driving at night, the cable light will guide you to find your cellphone, apart from this, it will make your trip interesting. he internal PCB board adopts the integrated power supply line, which can charge the phone and LED light simultaneously with high and low power. Guaranteed 2.1A charging and 60MA low current, there is no step-up transformer and double insulation protection in pure 5A safe power supply line, thus provide stable current and has long working life. 4. If you have any questions please contact us in time, we will provide a satisfactory solution.